A new garden style? Call it “Country Formal” – Johntheplantman's stories, musings, and gardening. 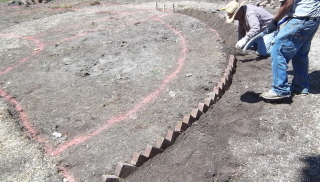 We will have a pretty formal looking brick lined garden in the center of the project. This garden is designed to be low maintenance, meditative, interactive, and visually pleasing. 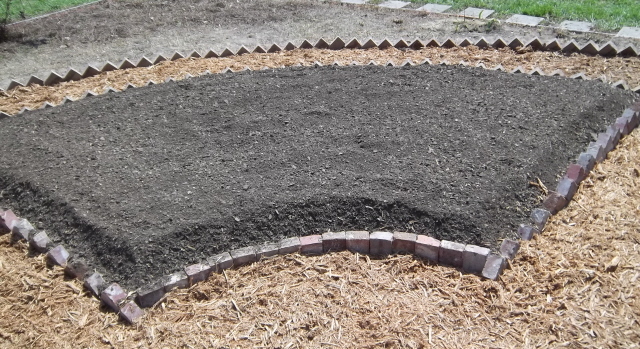 The raised beds will be bordered by a “no grow” zone for the control of invasive weeds. 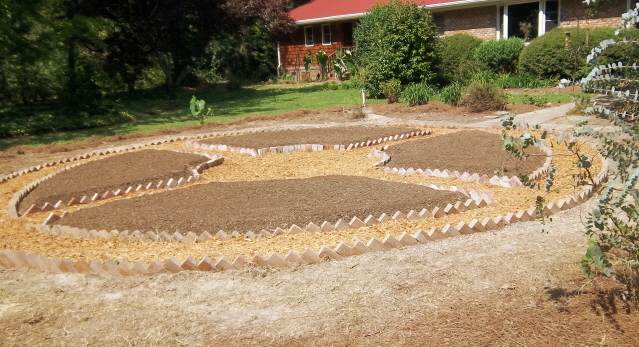 The floor of this zone will be river gravel and the plantings will be in containers. I can think of all sorts of benefits that will present themselves with this idea. 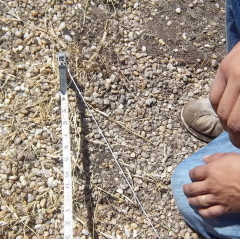 Irrigation will be through drip tubes and regulated with a clock. 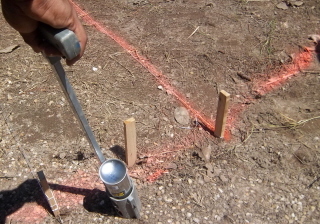 We start with a stake in the center of the garden to use as a pivot point. I love my ‘pistola de pentura’ (paint gun). I can tie one end of a string to the stake in the center of the garden and another to the paint gun. 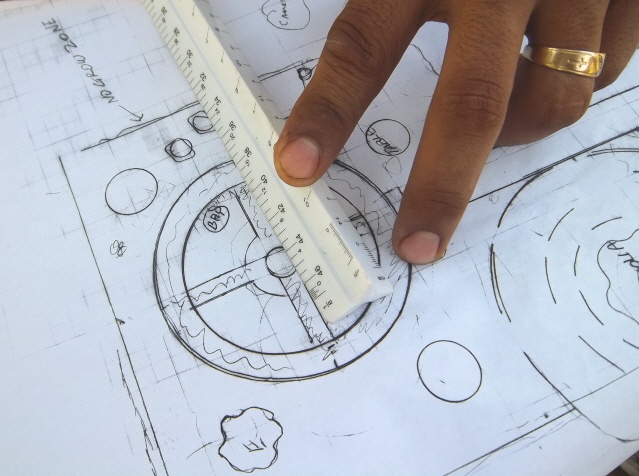 An accurate 30 foot circle can then be drawn just like we did it in grammar school. 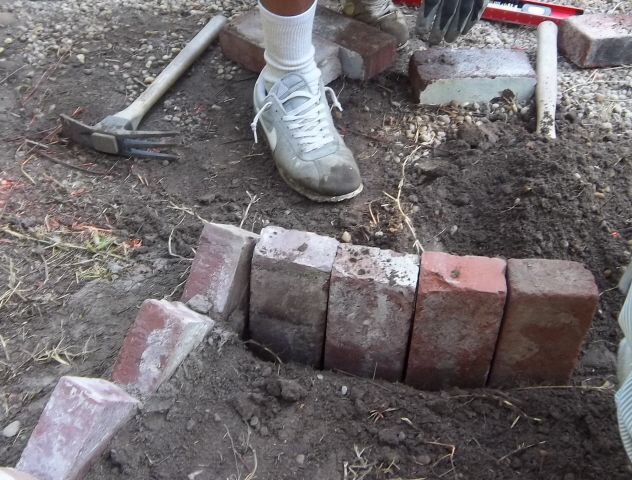 We begin installing the bricks keeping in mind that we will add four inches of compost on the inside and three inches of cypress mulch to the pathways. One of the good things about building country style is that “you can’t mess up country style.” One of the hard things is that when you run into a problem, there are no guidelines or rules. We had to think a bit about how to make the center circle stable and visually pleasing. I liked the view of the garden from this corner. We took particular care to design and build around the beautiful eucalyptus tree. I think it will be a wonderful background focal point. Our next step will be to enhance the perimeter of the garden with an entrance planting and a sitting area in the shade under the magnolia tree. I’m really excited about this project. I hope you are enjoying it, too. Before leaving the job, I stood and looked at this quadrant for a while. 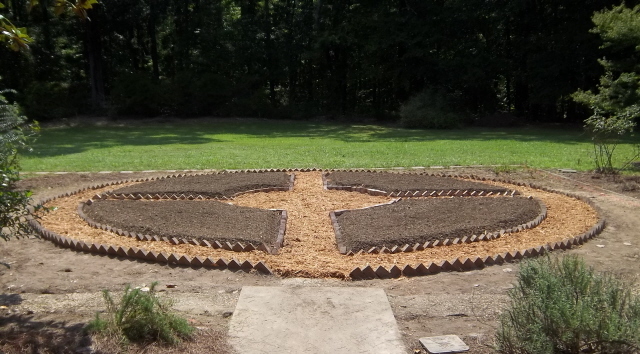 I still don’t have the planting design worked out, but I am a man of faith. Looks great. Ours, on the other hand, is ‘Country Informal’. Probably examples of every invasive plant adapted to Iowa! Still identifying a few. You make this look so easy! I like the way this is coming together. The problem is that the client will offer no help on what we will plant. I’m thinking of a “four seasons” theme, but I’m not quite sure what that means. plants what does well in your area!!! Pingback: Planting Tulips in the “Country Formal” cut flower garden. « Johntheplantman's stories, musings, and gardening.